We operate a variety of kayaking trips on a daily basis in the pristine blue waters of the Gulf of Mannar & Palk bay which is easily accessed from our base camp Kathadi South & Kathadi North located in Rameshwaram. Located on the southeastern tip of the subcontinent, the Gulf of Mannar is known to harbour over 3,600 species of flora and fauna, making it one of the richest coastal regions in Asia. 117 hard coral species have been recorded in the Gulf of Mannar. Sea turtles are frequent visitors to the gulf as are sharks, dugongs, and dolphins. However, the combined effects of 47 villages, with a total population of around 50,000 has meant that overharvesting of marine species has become a problem. Fish catches have declined, as have pearl oyster, gorgonian coral, and acorn worm populations. Local fishermen rely on the reef to feed their families, but destructive fishing methods combined with the stress of pollution and coral mining have meant both nearshore and offshore catches have decreased. Endangered species include dolphins, dugongs, whales and sea cucumbers. 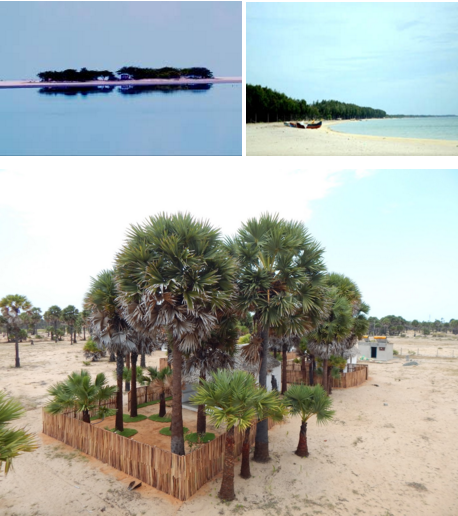 In 1986, a group of 21 islets lying off the Tamil Nadu coast between Thoothukudi and Dhanushkodi were declared the Gulf of Mannar Marine National Park. The park and its 10 km buffer zone were declared a Biosphere Reserve in 1989. 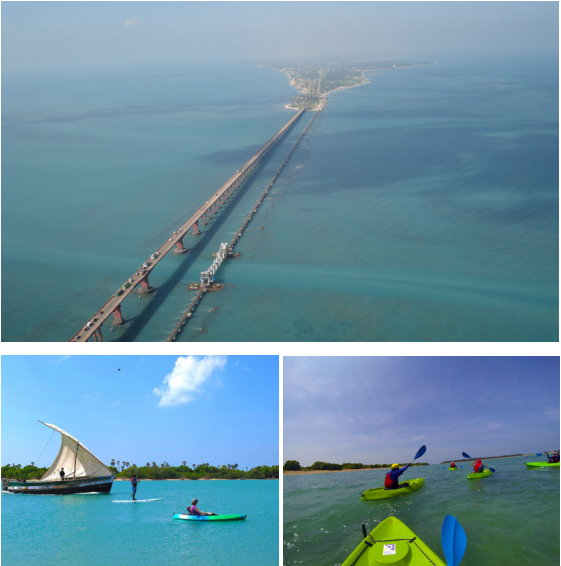 We paddle along the coastline of Rameswaram creating opportunities to interact with wildlife & nature. We explore the surrounding beaches with beautiful coconut tree alcoves & get a chance to observe traditional fishing methods. There is an opportunity to snorkel since we navigate through shallow bays on our trip. There are chances of spotting dolphins, sea turtles & marine biodiversity along the way. Refreshments will be served at our base after a rewarding paddle. Includes 2-hour Kayak trip, equipment rentals, safety gear, beach transfers, shower facilities & refreshments as per the itinerary & Instructor fee. We paddle along the coastline of Rameswaram creating opportunities to interact with wildlife & nature. We explore the surrounding beaches with beautiful coconut tree alcoves & get a chance to observe traditional fishing methods. There is an opportunity to snorkel since we navigate through shallow bays on our trip. There are chances of spotting dolphins, sea turtles & marine biodiversity along the way. Refreshments will be served at our base after a rewarding paddle. Accommodation is comfortable & boutique at Kathadi North. Includes Kayaking equipment rentals, safety gear, beach transfers, accommodation & meals as per the itinerary & Instructor fee. We paddle along the coastline of Rameswaram creating opportunities to interact with wildlife & nature. We explore the surrounding beaches with beautiful coconut tree alcoves & get a chance to observe traditional fishing methods. There is an opportunity to snorkel since we navigate through shallow bays on our trip. There are chances of spotting dolphins, sea turtles & marine biodiversity along the way. Accommodation enroute in local homestays and campsites.